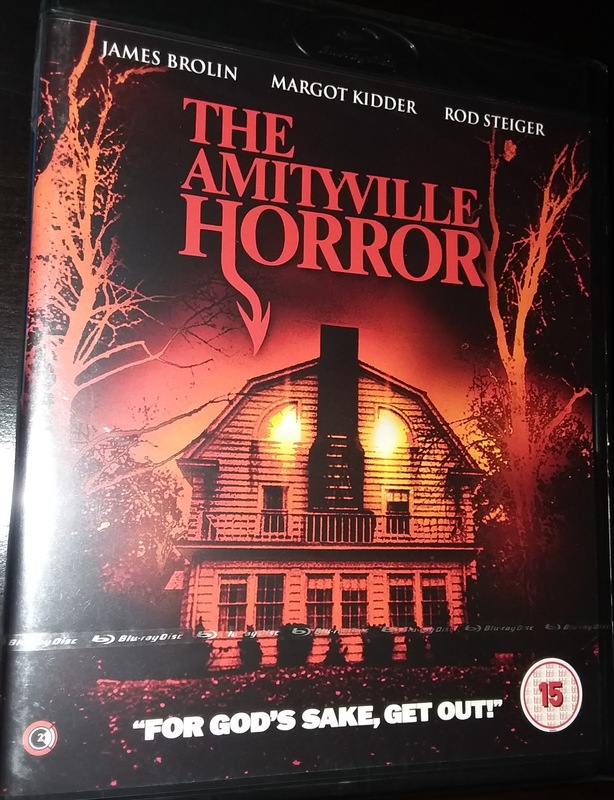 Product Description: When George and Kathy Lutz and their children move to Amityville Long Island. They believe they have found the perfect family home. But the house has a shocking history and within it's walls a demonic presence lies in wait that will turn the Lutz's lives into a living nightmare. I probably have seen this well over 50 times. It’s one of those movies I tend to return to repeatedly, or at least watch every time it’s on TV. Now you can experience this awesome ghost story, this classic spook fest on a wonderful special edition, high quality Blu-ray being brought out by the UK company Second Sight Films. Second Sight mastered a perfected Blu-ray. Second Sight gives a stunning example of creating a product with high standard toward the art form of the film. I consider movies a way of life. I consider movies an art form of imagination, and the exploration of life in general, no matter the subject. When I see a company treat films the way they should be treated, it makes me giddy, happy, and worthy to praise them for what they do for film, and Second Sight gives that reality of respecting film. I first saw this on a Friday Night visit to a late night horror double feature back in 1988, which seems so long ago. I have always been a fan of this horror film. The Amityville Horror needs no introduction into the movie world. I feel this is an often overlooked and underappreciated horror movie. Directed by Stuart Rosenberg who I have often felt was an overlooked director. I think he was a master director period, delving deep into the recesses of nightmares, drama’s, suspense and thrilling cinema. His talent shined in his many years of cinema making, and his unique gifted imagination, and imagery through this film, is something that makes you follow along and experience everything in a frightening way. His mastery in crafting a scary reality, and storytelling is a dynamic reality that he owns, and operates with an expertise that few directors can ever grasp. I have always returned to this film to experience the horror that he grasped, so well. 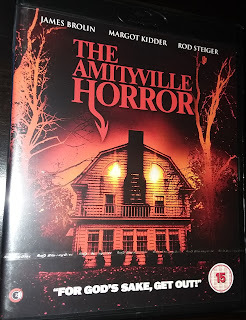 The Amityville Horror is a unique blend of horror. It has classic spooks, trademarks of classic horror, and the touch of a Drive-in style, late night film. It’s a film of ghostly perfection, and over the top wonderment of old school horror, mixed with a dirty gritty style of classic Late Night Cultish cinema. The Amityville Horror is a unique trip into a darkness of possible truths. It’s a story inside a story. A brutal crime, a murder of a family. A haunted house. One watching, or one researching the story must come to there own conclusions on if the story is true or not. What ever the case, supposed based on a true story, or one hell of a fictional ghost story, whatever the case is, it’s a film, a horror film, a ghost film that lingers inside your mind and nightmares. A classic mix of late night fever, cult cinema. Drive-in flare, and the beauty of classic horror. Second Sight did a great job of creating a fantastic product. They gave all the lovers of Drive-In cinema, of classic horror, a perfect example of how films should be treated. Compared to all the other outlets of this film, VHS, DVD and even television, nothing compares to this product. Second Sight Films has created a vibrant, crisp imagery. It has never looked any better. Comparing it to all the other releases, they have no baring toward this. This is a golden ticket of visual newness. The Audio is equally the same. It has never sounded any better. A video and audio mastery. Another beautiful example of treating an older film and bringing it out on a wonderful High Definition reality. The audio is fantastic. Sounds amazing. The video is vibrant and colorful. Both audio and video are crisp to sight and sound. Jam packed with extras. This production is packed with awesome, amazing special features. The purchase of the Blu-ray is worthy to buy, just to experience the awesome unbelievable special feature. Original Trailer, TV Spots and Radio Spots. This Blu-ray is a must own, must experience reality. Second Sight Films went above and beyond in capturing a new outlet for this Drive-in classic of ghostly spooks. A brilliant special edition that is worthy to be talked about and praised. Great product. Some awesome special features. Truly a must own experience. This Awesome amazing Blu-ray is being released on Special Edition Blu-ray by Second Sight Films on Oct. 15th 2018, just in time for Halloween. Make sure you head over to http://www.secondsightfilms.co.uk/ for all the wonderful Films they offer on Blu-rays. The main page that gives you these beautiful releases on top quality Special Editions.